ReTac Textures is ideal for customers wanting to create eye-catching graphics in home, business, retail and display environments. And because it’s ReTac polymeric self-adhesive vinyl with ultra-removable adhesive backing, it can be easily removed and repositioned time and time again. ReTac Textures adds depth and visual appeal to static, flat images with its embossed textured finish. 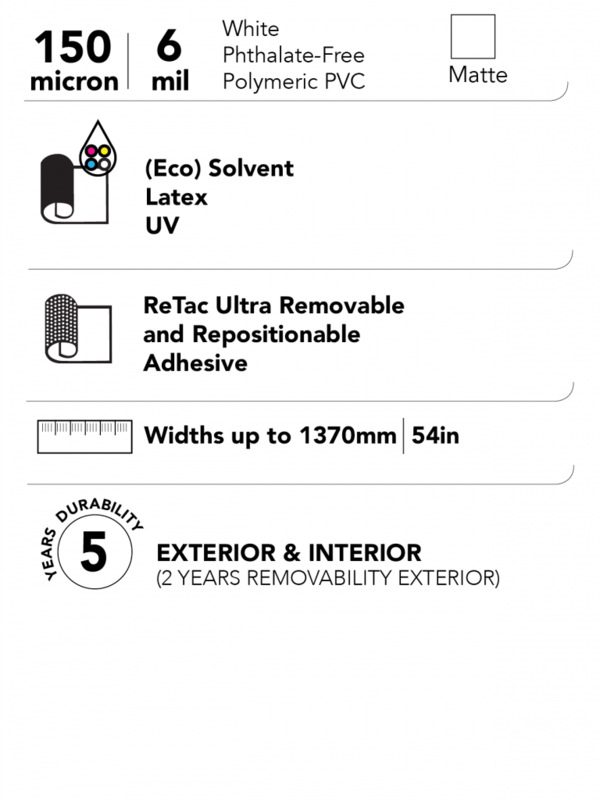 With ReTac ultra-removable adhesive on the back, eye-catching graphics printed on ReTac Textures can easily be removed and repositioned multiple times without the worry of adhesive residue being left behind. The film can be easily applied, removed and repositioned without surface damage or loss of adhesion. ReTac Textures is a 150μ (6 mil) printable, matte white phthalate-free polymeric PVC film with ReTac ultra removable adhesive. It has an embossed canvas, sand or linen-like finish that adds depth and visual appeal to static, flat graphics. A subtle texture draws attention to your image or message in a distinct and creative way. Ideal for custom wall murals, interior décor, retail displays, trade show graphics, textured labels and more, ReTac Textures are compatible with (eco)solvent, UV and latex printing technologies. The key to the new film is the ReTac ultra-removable adhesive on the back. Drytac’s ReTac technology is superior to standard removable adhesives as it can be cleanly removed and repositioned multiple times.